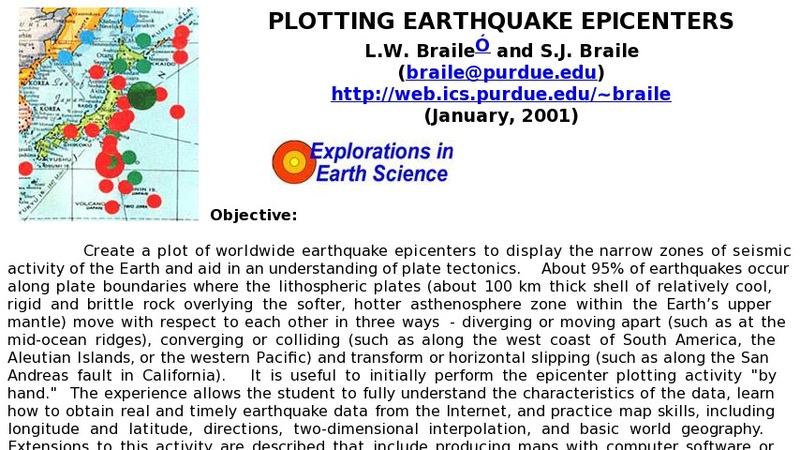 In this activity students create a plot of worldwide earthquake epicenters to display the narrow zones of seismic activity of the Earth and aid in an understanding of plate tectonics. Students will either plot a list of earthquake locations on a small map or plot daily or weekly locations from the Web on a large wall map of the world. It is useful to initially perform the epicenter plotting activity on an individual basis. The experience allows the student to fully understand the characteristics of the data, learn how to obtain real and timely earthquake data from the Internet, and practice map skills, including longitude and latitude, directions, two-dimensional interpolation, and basic world geography. Students will discover that about 95 percent of earthquakes occur along plate boundaries where the lithospheric plates move with respect to each other in three ways: diverging or moving apart, converging or colliding, and transform or horizontal slipping.